My 12-hour rally was over and I had met both of my goals – stay upright and healthy, and Finish. Furthermore, I had determined by the number of DNFs that I had somehow managed to land on the podium. I had a great time, followed by a good rest, so now it was time to enjoy the post-rally festivities. The full report of my 12-hour ride is here: 2011 Utah 1088, Part II: Rally Day! I got up at 5am and headed down to the parking lot to greet the real rallyists as they checked in to the finish line. These are the folks who entered the 24-hour and 3-day events, the hard-core long-distance enthusiasts on big custom-outfitted motorcycles. Most of them don’t even get warmed up and settled in the seat until long after 12 hours has passed. Some had arrived earlier in the morning and were already recovering in bed. Some had informed the RM that they would not be making it in on time for a variety of reasons – rest, mechanical failure, bad time or fuel management – but hoped to return in time for the banquet. Tragically, we also learned that one of the riders got tangled up with tornado winds in Nebraska and had ridden his last ride. That news definitely put a damper on the morning’s activities, but for the most part, the returning riders were upbeat and enthusiastic about their adventures. Rich made it in from his 3-day ride with about an hour to spare. Time to move on to rest, war stories, and the awards banquet. 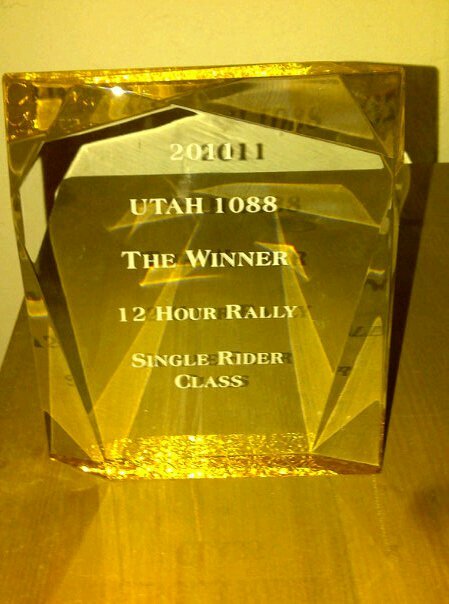 I’ll just come right out and say it – I won the Single Rider Class of the 12-hour Utah 1088 rally. I already knew I was on the podium because of the four DNFs, but I never dreamed I would be the winner. I somehow managed to ride 564.6 miles in 11 hours and 31 minutes on a 250cc motorcycle and earn 29,730 points. Click these links for the complete results from the 3-day, 24-hour, and 12-hour divisions. Also, click here for a summary of the total miles for each rider. Oh, and one more thing: I earned a MERA Certificate for riding >500 miles in 12 hours! The cert showed up in the mail in August. 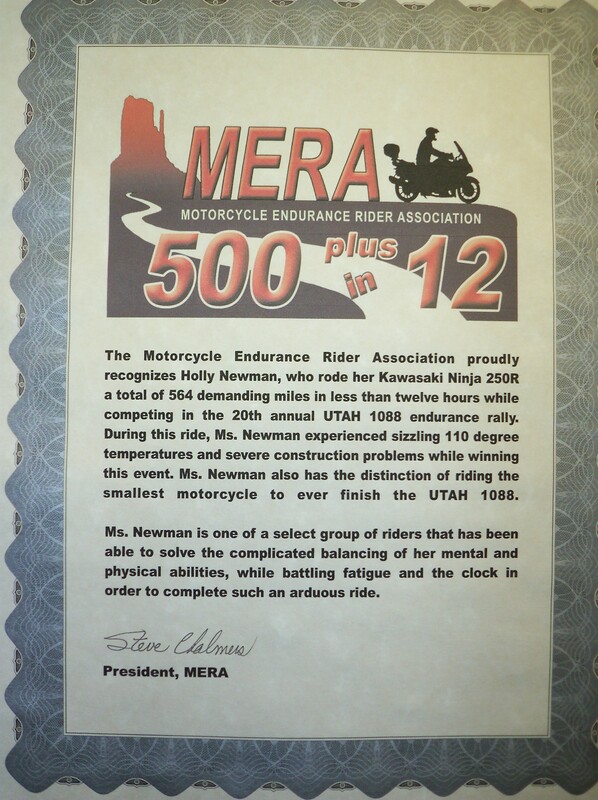 This is one of the great personal touches that Steve puts on his rallies – it’s not just a generic certificate, it actually acknowledges details about MY ride! Referring back to the articles I wrote on preparing for this event (which are linked in the headings), I want to highlight the improvements that I found most significant. The 250 Ninja is NOT a rally bike. Most of the riders who do these things are on big bikes – 1000cc and larger. In addition, many of them have been heavily modified with custom-made seats, extra fuel tanks, lights that turn night into day, and all manner of electronics. Though Rich and I made significant changes to my bike, what we did is nothing compared to what you see on the big bikes that the serious riders use. In fact, as I pointed out in that article, most of the changes we made were underway before I even decided to enter the rally. That said, I want to point out the two most important changes, without which I know I couldn’t have survived for 12 hours. Riding position. Changing from an aggressive sporty position to a more natural upright position was key. This was accomplished by raising the handlebars and seat and lowering the foot-pegs. The result was an amazingly comfortable riding position that sustained me until about an hour from the end, and then the only thing that gave up was my derriere. Throttle-lock. I have no doubt that I would have given up without a good throttle-lock. I used it for much of the ride, especially on the straight interstates and rural highways. On the twisty stretches where I couldn’t use it, my aching thumb and wrist quickly reminded me how bad the ride would have been without it. Flip-up Helmet. When I decided to buy this, I thought it would enable me to eat and drink as I rode. That is not the case, nor is it the true benefit. With the hydration tube and the retracting reel, I can drink without flipping it up. And the thought of eating on the fly turned out to be ridiculous – even if I had figured out a way to extract my jerky from the tank bag without crashing, I probably would have bitten holes in my cheeks. No, the value of the flip-up is that you can have meaningful and non-threatening interactions with humans (convenience store clerks, Checkpoint personnel, locals who know where the 3600-pt memorial is) with the helmet on. I knew from my limited shakedown experience that I wanted to avoid removing my helmet if possible – not only does it take time and have to resettle into position, but I also knew that if I allowed myself to feel the relief from the sweating and itching, it would be doubly annoying to have it return. Ear Plugs. I had no previous experience using ear plugs while riding, but on the advice of seasoned rallyists I decided to try them out. I first rode with them on Shakedown ride #3 to get used to the feeling and difference in the sounds around me. And then on the way home from that ride, I forgot to put them in. It took me about 30 minutes to realize my mistake. What a difference – it felt like all 250cc of the bike was in my head. And on this rally with the higher speeds and RPM, I would have been miserable without them! Thanks to PlugUp for a great product. Even though I have never ridden in a rally before, I have been intimately involved with these events for nearly 20 years because of Rich’s participation. I acknowledge that I’m a dilettante, but I have paid close attention to his learning process (both successes and failures) in all aspects of rallying – preparing the bike, managing gear and paperwork during the ride, pacing, and routing. In other words, by pure osmosis I was perhaps one of the best-prepared rookies ever to enter a rally and I was rewarded for the effort. As I reflect on my shakedown rides, my pre-rally planning, and the execution of my plan, I can see a few opportunities for improvement but I can’t identify any significant mistakes. That’s one of the reasons I went to the trouble to write all of this up – I’m more than willing to share my experiences with other rookies. Looking forward to next year, the only thing I would change in my strategy is to soften my “off-the-bike” and “wrong-direction” avoidance rules and go for one or two of the “in-town” Boni if they seem doable. When I first entered the rally, my plan was to do it once to shake the dilettante monkey off my back and then quietly slide back into my supporting role for Rich. But I had a blast and I want to do it again. I have already told Steve that I will keep entering the Utah 1088 as long as he continues to offer the 12-hour version. Not going to happen, not a chance. I’m not comfortable on big bikes, I’m nervous riding at night, and I’ve never been worth a damn on graveyard shifts or any other sort of all-nighter. I have neither the skills to ride fast nor the desire to ride far. And I have no interest in doing any hard-core customization on the Ninjette, like adding fuel capacity or lights. Will the field be larger next year? 2011 was the first year that Steve has offered anything other than a 24-hour version of the Utah 1088. But both the 12-hour and the 3-day versions were well-received and he has decided to use the same format next year. My hope is that reports like this will draw more riders to the 12-hour rally – it is a perfect place for rookies who want to give it a try and veteran rallyists who are ready to scale back from the longer rides. In fact, I’m toying with some ideas for additional incentives to riders who enter on small bikes like mine – sort of a Baby Bike Challenge. So with all that said, it’s time to sign up for 2012! The 2012 Utah 1088 Entry Form is now available and I encourage my riding friends to give it a try. And yes, I entered it and ran it. Here’s that story: 2012 Utah 1088, Part 1: What? Am I really doing this again? This entry was posted on Wednesday, September 7th, 2011 at 5:00 pm and is filed under Endurance Rallies. You can follow any responses to this entry through the RSS 2.0 feed. You can leave a response, or trackback from your own site. I really enjoyed all your posts about this event and its preparation. you write very well. have you considered trying to find a market where you could actually sell this? Thanks for the write-up. I found this very enlightening. I haven’t done any long distance riding, but thinking about it. A link to your blog was sent to me by a fellow LD rider. I’m running the 12-hour this year, and it looks like your entries on your own 12-hour will become part of my prep. I’ll see you there.